It amazes me to think that only a few years ago, I thought Jonathan Chait was an insightful analyst — even when I disagreed with him. I no longer think that. He’s just sliding along on his reputation at this point. Yesterday, he wrote, How Can Hillary Clinton Win the Bernie Sanders Vote? Always loving the counter-intuitive take, the subtitle is, “By moving to the… right? That’s what the data says.” Oh my! Such shallow thinking. Chait presented some data that showed that the Sanders holdouts — the ones saying they will never vote for Clinton — are actually more conservative than Hillary Clinton supporters. I have little doubt. It’s been well known that Sanders did best in open primaries. So he was pulling from independents. And his populist message certainly did appeal to conservatives, even though that was not the core of his support. But these are supporters who Clinton is most certainly not going to get — even if she does move to the right as Chait suggests. At the same time, there is an opportunity cost. Clinton could lose support from the vast majority of Sanders supporters who do now plan to vote for her if she decided to make a sharp right turn. (Of course, she won’t do that. I don’t understand why so many people seem to think that politicians have no actual beliefs — as if they would all join the Nazi Party if it would get them elected.) So no: Clinton can’t win “the Bernie Sanders vote” by moving to the right. This gets at something that has bugged me for months. Most Sanders supporters are like me: they don’t hate Hillary Clinton; they just like Bernie Sanders more. But despite this, Sanders supporters are painted with a broad brush using obnoxious Twitter trolls as the model. It bugs me especially because I like Hillary Clinton. There aren’t that many Democrats that I would have voted over her. Certainly Elizabeth Warren and Sherrod Brown would top her. But she’s vastly superior to my own Democratic Representative, Mike Thompson. It was interesting watching the coverage of last night’s primary. My biggest concern about Hillary Clinton is that she seems soft on the TPP. I’m afraid she will “evolve” on the issue. I don’t think there’s a strong probability there. Politicians reflect their times and I don’t think that Bill Clinton would support NAFTA if it came up today. So I’m not too worried. Just the same, listening to Donald Trump talk so forcefully against the TPP last night would have inspired me if I didn’t know he was a pathological liar. She won’t move to the right-she can tell the country is more in line with her original views on economic issues. Unlike the 1990s, she can be liberal again. It is a liberalism tempered with reality though. She won’t ever be bold and I think that is what the country wants-patient steps in the right direction. It’s hard not to get mad. What’s vile? How do you know the poster is white, and why do you care? Sanders agrees with King. Clinton does not agree with King. If you agree with King, you should support the politician who has similar views, not the politician with dissimilar views. What’s wrong with saying that? Sanders is the pro-King politician. Clinton and Trump are the anti-King candidates. Where does this myth that Clinton doesn’t support the work of Dr. King come from? At 16-before she could literally vote-yes, she was a Goldwater Girl. But by the time she could vote she was going undercover in the South to expose racists. How on earth is that being anti-Martin Luther King, Jr? King was a leftist. He was very clear that there can be no racial justice without economic. He complained loudly about those who keep saying ‘slow, slow, slow, not now’. Is C willing to loudly disavow boy Clinton’s racist ‘anti-crime’ policies? I hope so, but I doubt it. And yes, they were racist – I’m unwilling to argue. You mean the bill that Sanders voted for and until a year or so ago used to tout on his various websites as “proof” he was tough on crime? Clinton is well aware that the fact that racial inequalities are a major problem and it is twinned to economic justice. Unlike say a certain orange squirrel wearer. “Orange squirrel wearer” — that’s pretty good! To me he looks like the Original Series “Star Trek” alien design which never quite made it to the screen. 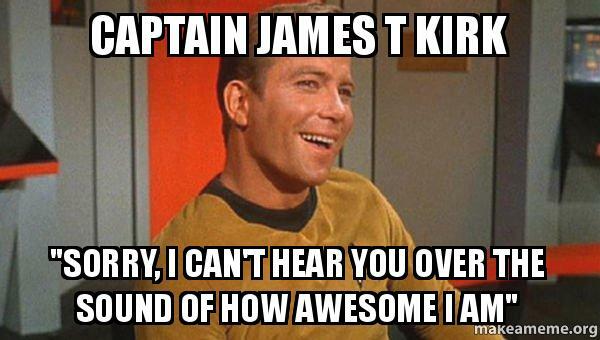 Actually, that hair looks a lot like tribbles’ fur. Could it be possible that Trump is murdering tribbles for the sake of his head? I know the poster is white because I went to high school with him. Granted, he may not be the one who originated the meme, but he’s who I was responding to. And, regardless of race, I think there’s something off about putting words in a dead man’s mouth. Maybe, but is that unusually rude, or just par for the course on the Internet? I will tell you that I find the whole ‘meme’ trend off-putting in general. It’s another of those things that makes it easy to be unclear about whether you are being ironic or not; it’s often mean-spirited. I tend not to like it even when I more or less agree with the view being expressed. Still don’t agree that this is actionably obnoxious behaviour, though. Unlike harassment (real harassment that is): I’m always against that no matter who is doing it. It is unusually rude, that was the whole point of my comment: most Bernie supporters are fine, and the jerks are the minority. But if you’re saying “it’s just the internet, it doesn’t count,” then I disagree. The internet is now part of most people’s lives, and you can’t make excuses based on where you said something. I’m not sure what “actionably obnoxious” means, though- I’m taking no real action other than mocking it online and telling the person I find it offensive. I see “it’s just the internet” being a good defense in that it is so good at amplifying minority views. What was funny in 1968 in The Producers becomes almost natural. Now Franz Liebkind would have a Facebook page with 100,000 followers. I assume (per Jurgan below) that by “actionably” you mean deleted/flagged by a site moderator. @Jurgan, I think I’m right in this assumption, and I think we all believe many sites need more moderation! Unfortunately, as I seem to have slipped into sermonizing, I don’t have any moral to end the sermon with. I don’t know how we can balance the fun of Internet interaction with its harmful tendencies. How we end up getting in arguments with strangers we often really agree with more than not. The way Internet interaction standards & norms evolve as we travel along will certainly be an interesting thing to observe. James-are you in MN? Because if you are, do you know anything about MN-02? Not a lot. It’s part rich suburban and part rural/farm. Does have one little college town (Northfield) where Wellstone used to teach/organize, so maybe a little less contemptuous of ALL Democrats than other similar districts. The incumbent GOPer is retiring, so that always opens a little crack of opportunity! 1. JTK is that awesome. 2. I try to tell people to chill out when things get too heated. But that doesn’t work if I’m involved. I know what you mean about irony. Sarcasm is one of my favorite tools, but it is to the point now where you just can’t say anything extreme enough that there aren’t other people saying the same thing earnestly. I don’t know about pro- or anti-King politics. Certainly two of Bill Clinton’s greatest accomplishments were very much part of the new Jim Crow. And I know that Hillary Clinton has defended those policies in the past, but certainly not recently. But the meme is talking about a teenager supporting Goldwater. 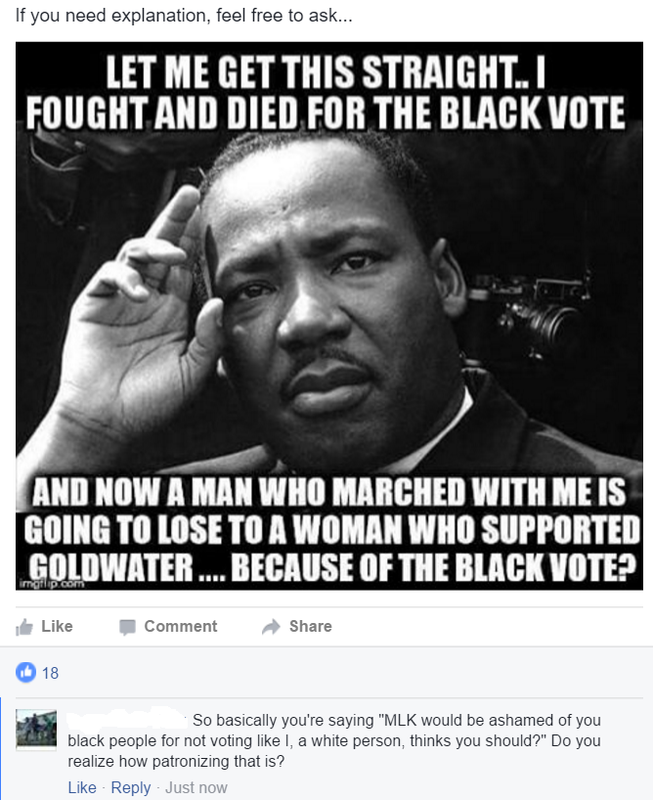 It also claims she supported him because he was for segregation. Even Goldwater himself was more nuanced than that. And in his old age, Goldwater made a lot of sense; he was one of the best critics of the Republican Party. Oh yeah, I haven’t seen anything that bad on Spacebook but definitely on Twitter and in other places. Oh look-this blog.